Sen. Marco Rubio, R-Fla., introduced a plan to reform Social Security and Medicare while cautiously answering questions about a potential presidential campaign at a May 13 National Press Club luncheon. With the possibility of a presidential run by him in 2016 serving as the elephant in the room, Sen. Marco Rubio (R-Fla.) unveiled a new plan to reform retirement benefits during a National Press Club luncheon May 13. Rubio's proposal would allow average Americans to join federal retirement accounts similar to those enjoyed by lawmakers. In addition, it would gradually raise the retirement age for younger workers, lower the growth rate of Social Security benefits for wealthier Americans and eliminate the Social Security payroll tax for those who choose to work after reaching retirement age. The details of the plan, however, seemed to take a backseat to the politics of the moment. Following his prepared remarks, Rubio cautiously fielded a number of questions related to the looming White House race. When asked if he would still run for his party’s nod if former Florida Governor Jeb Bush, a longtime political ally of Rubio, threw his hat in the ring, Rubio said that he would not let the presence of others in the field determine his decision. Rubio also, addressed his role in creating comprehensive immigration-reform legislation in the Senate, an action that nearly cost Rubio the support from the conservative wing of his party. 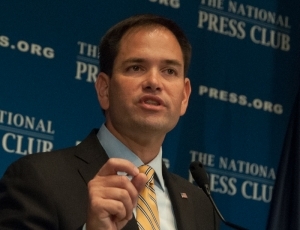 When asked by the luncheon moderator, National Press Club President Myron Belkind , if he had any regrets for his role in the formation of the stalled legislation, Rubio said that he knew that tackling immigration would prove to be controversial. But he primarily regretted, he said, not being able to see reform through to fruition. The senator was given ample opportunity to walk back remarks he made last Sunday, when he told ABC’s Jonathan Karl that he did not believe human action is playing a role in dramatic climate change. Rubio emphasized that he does believe in climate change as a phenomenon, but that proposed trade-offs demanded by environmental legislation are not worth the economic risk. “For people to go out and say 'if you pass this bill that I’m proposing this will somehow lead us to have less tornado and less hurricanes' that's just not an accurate statement and that's what I take issue with,” Rubio explained. Rubio has been viewed as a rising star within Republican politics since beating then-Florida Governor Charlie Crist in the Republican primary in 2010. Despite declining to enter the 2012 Presidential race, Rubio was widely seen as a potential running mate for candidate Mitt Romney.